The need for qualified human resources are getting increased by the rapid development in science and technology and by global transformation of production and consumption relationships. In this context the welleducated human resources who can reach ,use and improve the knowledge effect the countries’ economic and technical improvement and their socio-cultural structures as well. Today’s information soceity needs individuals with creativity and communicational skills as well as contemporary knowledge, perfection in practice, effectiveness in economy by transforming knowledge to product or service. This can be formulated in education as: individual and social competence ,vocational and technical competence, leadership and management competence…To reach this aim in education , scientific data based educational programmes, practical application fields, and also social, sporty , artistic activities and mediums for free time sharing are all demanded. The role and importance of vocational and technical education stands out as in the structure of educational system based on knowledge, skills and creativity concerned with the relations of proggressing, employing and competition. This study aims to emphasise this point, and discuss the problems and solutions in this context. The framework of the study has the following subjects:. 1)The role of the vocational and technical education in Turkish education system 2)The problems in the educational programmes in Vocational Schools, evaluations on their content, methods and outcomes. 3) Sampling: Uludağ University Vocational School of Technical Sciences is put forward (presented) as an example via the projects, activities and applications has been done in/by the school. Uludağ University Vocational School of Technical Sciences has 9 departments, 15 programmes, more than 3000 students and 69 members of academics and lecturers . The school educating technicians is very effective in Bursa and its district as supplying staff member for the work environment in the region. It is a model for the other vocational schools with its double diploma , lifelong learning programmes and quality processes. Last 5 year applications and activities of the U.Uni. V.S.T.C. are presented as in the following topics: -Co-operative projects with industry (training courses, apprenticeship applications, employments, partnerships in the projects) -International education programmes (1+1 double diploma, Erasmus exchange and mobility programmes for students and lecturers) -supporting the students to participate in academic and social activities (to parttake in congresses, symposiums, exhibitions, contests projects and social, sporty, artistic activities) 4)The Targets and Proposals on future of the vocational education Vocational schools training technicians who are very important for the structural frame of the working World are evaluated in this study with their structure, educational programmes and relations with the labour market. In this context Uludağ Uni. Vocational School of Technical Sciences is presented as a good model with its training programmes, cooperative projects with industry, social activities and international attempts for qualified education. As a result, the basic emphasise is the importance and role of the institutions of vocational and tecnical education. Increasing the quality and transparency, achieving the international competence conditions in the schools are aimed. Not only theoretical knowledge , but practical applications are urgent for the vocational skills and experiences so, the hardware facilities, spatial and academic structure should be improved and the relations and cooperations with the industry should be strengthened. Moreover than vocational knowledge and skills, the interests on art and culture are required. Educating programmes targets on the members who are solving problems, proposing creative alternative solutions, constructing social relationships, comminaciting effectively , besides conscious about responsibilities and capacities and coping with the competition in global labour milleu. So the the education programmes supported by the social activities, projects, contests, seminars,and presentations effect the social developments of the students, feed their creativity, productivity and make difference within their working lives. Alkan C, Doğan H.ve Sezgin İ. (“976) Mesleki ve Teknik Eğitim Prensipleri, Ankara, p:2.-11 Baş İ.M., (1998)“Dalgalarla Gelen Gelecek Kurgu bilimci Guru: Alvin Tofler”, AD Business Notebook, p.28 Dura, C (1990), Bilgi Toplumu, Kültür Bakanlığı Yayınları, Bil Ofset Matbaası, Ankara. Mays A.B.,(1957) Meslek Eğitiminin Prensipleri ve Tatbikatı, çev: İlhan Özdil ve RemziÖncül, Maarif Basımevi, Ankara, Saygılı Ş., Cihan C. ve Yavan Z ., (2006)Eğitim ve Sürdürülebilir Büyüme: Türkiye Deneyimi, Riskler ve Fırsatlar, TÜSİAD Büyüme Stratejileri Dizisi:7, İstanbul, p.15. Sezgin,İ (1999), 16. Milli Eğitim Şurası: Konuşmalar, Görüşler, Kararlar ve Raporlar. Milli Eğitim Basımevi Ankara. Sezgin İ. (2001), Avrupa Birliğinin Eğitim, Öğrenme ve Gençlik Politikaları, Türkiye-AB İlişkileri Sempozyumu, Ankara Ofset, Ankara, , p.236-240. Şimşek A (1999), Türkiye’de Mesleki ve Teknik Eğitimin Yeniden Yapılandırılması, TÜSİAD, İstanbul, Deutsche Bank Research, Current Issues: Human Capital is The Key To Growth, A ğustos, 2005,www.dbresearch.com, (07,03.2008). ISNAD SAĞOCAK, A. Mehtap , YILMAZ, Engin , KARAHAN, Nevin . "Knowledge, Skills And Creativity In Vocational And Technical Education". 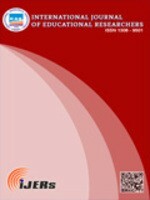 International Journal of Educational Researchers 4 / 1 (March 2013): 13-21.